Only 3 left in stock--order soon (more on the way). 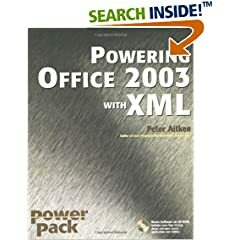 Buy this book with XML in Office 2003: Information Sharing with... by Charles F. Goldfarb today! Peter Aitken (Chapel Hill, NC) has been writing about computers and programming for over 10 years, with some 30 books well as hundreds of magazine and trade publication articles to his credit. His recent book titles include Visual Basic .NET Programming With Peter Aitken, Office XP Development With VBA, XML the Microsoft Way, Windows Script Host, and Teach Yourself Visual Basic .NET Internet Programming in 21 Days. He is an original co-author of the multiple edition best-seller Teach Yourself C in 21 Days. For several years he was a Contributing Editor at Visual Developer Magazine where he wrote a popular Visual Basic column. He is regular contributor to Microsoft OfficePro magazine and the DevX Web site. Peter is the proprietor of PGA Consulting, providing custom application and Internet development to business, academia, and government since 1994.